If you haven't read the first two posts in my Kombucha Series, check out Myths vs. Truths to dispel some common misconceptions and find out what kombucha can do for you. Then read Tips & Troubleshooting, to ensure your home brewing is a success. Now, for the final step: the recipes! Wash your jar with hot water, dish soap and a little bit of vinegar. Rinse well and set aside. Boil 1 quart of filtered water in a stainless steel pan. Remove from heat. Add your tea and steep for 10 minutes. Remove the teabags and add 1 cup of sugar. Stir until dissolved. Pour this sweet tea into your glass jar. 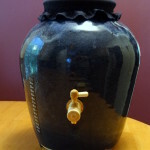 Fill the rest of the way with cold filtered water, leaving a few inches of room at the top. Stir to blend and then test the temperature. It needs to be 85 degrees or lower before going onto the next step. Add the starter tea, and then with clean hands, place the SCOBY on top. Set your kombucha in a good location. You want the temperature to be between 72-85 degrees, out of direct sunlight, with good air flow (not in a cupboard). Cover the top of the jar with a piece of tightly woven cloth, secured with a rubber band. Sing it a little song, send it some loving vibes, tell it it's beautiful, and then leave it be. In 7 days, start tasting your kombucha. You want it to be sour/tangy with a touch of sweet remaining. Alternatively, you can brew it longer until it is 100% sour, and then combine it with juice to drink. Just don't brew it longer than 30 days. Generally, kombucha is “ready” somewhere between 7 and 21 days. When your kombucha is done, wash your hands and get a clean bowl. Put the SCOBY in the bowl, along with 1 cup of the kombucha (also known as starter tea). 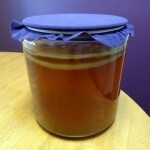 Ideally gather it from the top of the jar, because this is where the beneficial bacteria live. Beneficial yeast exist throughout the liquid, but are especially thick at the bottom of the jar. So, if you pull from the top, you're getting both the good yeast and good bacteria, but if you pull from the bottom, you're getting a yeast-dominant kombucha. You want your starter tea to be balanced. Once you've removed the SCOBY and starter tea, stir the remaining kombucha and pour it into a large pitcher and put it in the fridge. Or separate it into airtight containers for a second fermentation (described below). 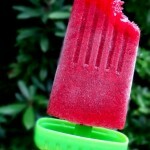 Or use some to make kombucha berry popsicles! Straining the kombucha is optional. To start your next batch of kombucha, go back to step 2 and repeat. Usually, a new baby SCOBY forms with every batch of kombucha, although when you first start brewing, it might take a few batches for this to happen. 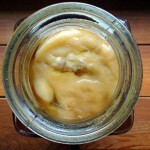 You can let your SCOBY grow up to 2 inches thick, but after that, you need to split it. Keep the healthiest looking SCOBY for your next brew. Clean some airtight containers with dish soap, water and vinegar and rinse well. 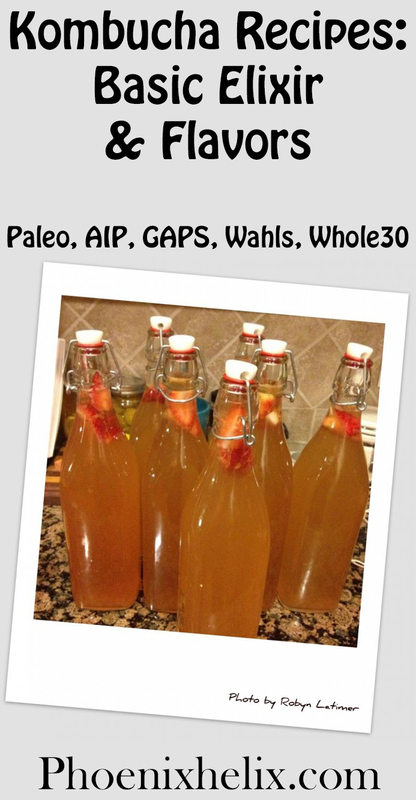 Pour fermented kombucha on top of the flavors and fill almost to the top, but leave an inch free for the carbonation that will develop. Put the caps on tightly and let them ferment at room temperature for 48-72 hours. Add a few pieces of fresh or frozen fruit. You can see in the photo that Robyn added strawberries. Add any fruit you like: blueberries, blackberries, mangoes, pineapple, peaches, pears, apples, etc. You can add dried fruit as well, but fresh fruit gives a stronger flavor. Add a chunk of fresh ginger, for a ginger-ale flavor. You can chop or grate it for an even stronger flavor. Add 1-2 Tbsp. of fresh squeezed juice: orange, lemon, lime, grapefruit, cranberry, pomegranate….your options are endless. Add a small amount of whole spices: cinnamon stick, cloves, etc. Add 1 tsp. of dried herbs: lavender, chamomile, lemon balm, rosemary…. Feel free to combine these flavor ideas: pineapple ginger, apple cinnamon, lemon lavender, etc. Use your imagination and have fun. The amount of flavoring used depends on the size of your container and your personal taste. You can adjust these amounts up or down, as needed. 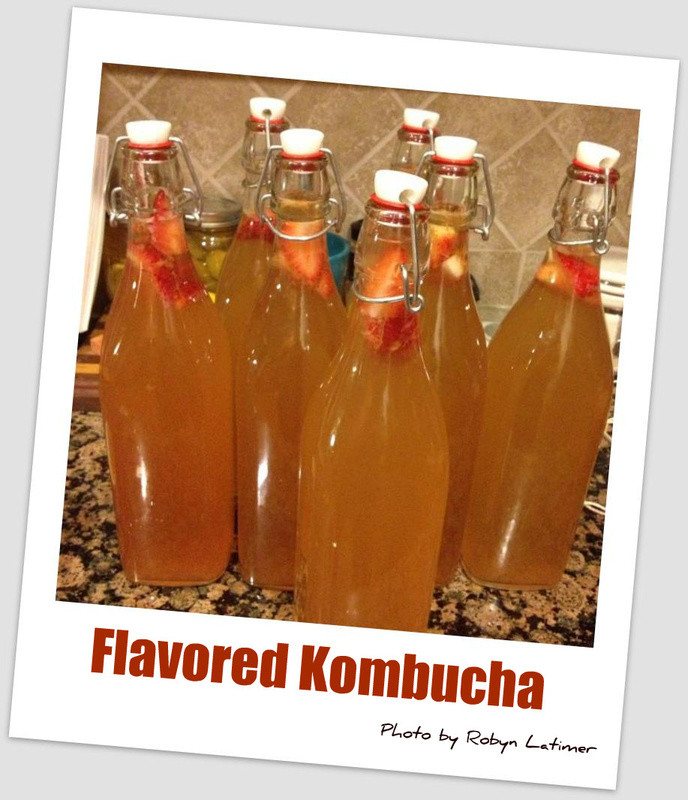 For more flavor inspiration, check out The Big Book of Kombucha, which has over 200 flavor recipes in chapter 11. You know the sediment and brown strings that form in your gallon jar of kombucha (a completely normal sign of the presence of beneficial yeast)? Well, they are likely to form in your flavored concoction as well. And sometimes tiny SCOBYs form in the liquid like jellyfish, or at the top of your container. You strain the second fermentation before refrigeration, to remove the fruit or juice pulp, and these will be strained out at the same time. If you forget about your airtight flavor fermentations and leave them on the counter too long, they can explode. So, don't do that! I couldn't find any information on when this might happen. At the week mark? Earlier? Later? It probably depends on how hot your house is, and how carbonated your kombucha was when you started this step. You can put your flavor fermentations in a box, just to be on the safe side. You can also open them daily to release some of the pressure. Update: After writing this series of articles on kombucha, a number of people asked where they could buy quality supplies. Not everyone has a friend to lend them a SCOBY and tutor them through the process. So, I decided to become an affiliate of Kombucha Kamp. Hannah Crum has been brewing kombucha for over a decade and sells everything from quality SCOBYs to continuous brew systems. Whatever you need, she's got you covered, and she even offers a money-back guarantee.